Ofsted will have its powers and budget for FE inspections boosted after the government was embarrassed over apprenticeship accountability, FE Week can reveal. The watchdog will now be given potentially as much as £7 million to visit every new apprenticeship provider. Critically, it will also have the final say over quality. The decision been dubbed “a victory for common sense, but more importantly it’s a victory for apprenticeships,” by education select committee chair Robert Halfon. The number of apprenticeship providers which are in scope for inspection has shot up since last year’s reforms, even while Ofsted’s FE and skills budget has fallen, despite many requests for more money [see below]. As a result, it has only been able to carry out early monitoring visits at a handful of these new providers. And skills minister Anne Milton admitted last week to the education select committee that it wasn’t clear who was accountable for quality at these new providers. There has lately been considerable dismay at mixed messages from the Education and Skills Funding Agency, which recently permitted a provider to recruit apprentices once more – just two months after Ofsted branded its provision “not fit for purpose”. The final word will now rest with Ofsted: if a monitoring visit results in an ‘insufficient progress’ verdict, a provider will be taken off the ESFA’s register of apprenticeship training providers. Neither the Department for Education nor Ofsted would comment on the new policy, which is understood to have come directly from the education secretary Damian Hinds. No one would say how much extra cash is involved. Mr Halfon wants Ofsted to “do the inspections and decide whether providers are good quality or are failing their apprentices”, while the ESFA should focus on “procurement and audit and looking at the finances of the providers”. “If Ofsted decides that a provider is not fit for purpose then they should be thrown off the register pretty quickly, and they shouldn’t then be allowed to continue by the ESFA,” he continued. Mark Dawe, boss of the Association of Employment and Learning Providers, described it as “an extremely positive development, especially if a judgement of ‘insufficient progress’ means an automatic ban on new starts”. The move follows last week’s education committee hearings, which left the government red-faced after ministers admitted they were confused about who had ultimate responsibility for policing apprenticeship quality. Officials from the ESFA and Ofsted, along with Ms Milton, faced a barrage of questions from committee members about the ESFA’s decision to lift Key6 Group’s suspension. Mr Halfon believes this undermined Ofsted. “I think the relationship between the ESFA and Ofsted over quality is quite difficult to define and I think we need to define that more clearly,” Ms Milton admitted. At the same hearing Paul Joyce, Ofsted’s deputy director for FE and skills, revealed the watchdog was still waiting to hear if it would be given extra resources to tackle the massive increase in providers it will have to inspect. He told MPs the issue had been “raised for several months now”, and although the DfE was “very receptive” it had yet to provide Ofsted with any more resources. FE Week understands the inspectorate has asked the department for an additional £7 million, which – if granted – would be a significant increase on its current FE and skills spend. According to a report published by the National Audit Office on Thursday, looking at Ofsted’s inspections of schools, the watchdog spent £10 million on inspecting FE and skills providers in the 2017-18 financial year. That’s a drop of £4 million, or almost 30 per cent, since 2010-11. 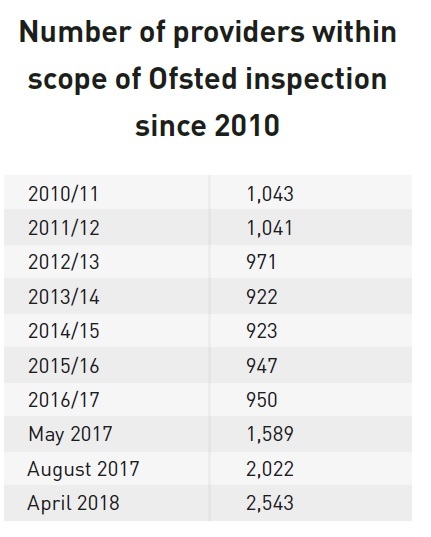 The number of providers Ofsted can now investigate has shot up since last May, when the apprenticeship reforms came into effect, after remaining steady at around 1,000 for the seven previous years. The figure now stands at 2,543, including all those on the register of apprenticeship training providers and those with an adult education budget allocation but not on the register. A spokesperson for the DfE said it is “in active discussions with Ofsted about their resources and potential extra inspection demands arising from the increase in the number of registered providers of apprenticeships”. The number of providers who can now be visited by Ofsted has increased dramatically since the apprenticeship reforms last year. But the education watchdog’s resources haven’t kept pace with the soaring numbers. Before the register of apprenticeship training providers was first published, in March 2017, provider numbers had remained at around 1,000 for seven years. By May last year, that number had risen to 1,589 – including all main or employer-providers on the register, and those with an adult education budget allocation but not on RoATP. Just three months later it topped 2,000, and the figure now stands at a whopping 2,543. Meanwhile, Ofsted’s budget for FE and skills actually fell during that time. According to a National Audit Office report into Ofsted’s inspections of schools it spent £12 million on inspecting the FE sector in 2015-16, £11 million in 2016-17 and £10 million in 2017-18. And, according to Ofsted’s own accounts, by 2019/20 its overall resourcing budget will have shrunk by 30 per cent since 2010. 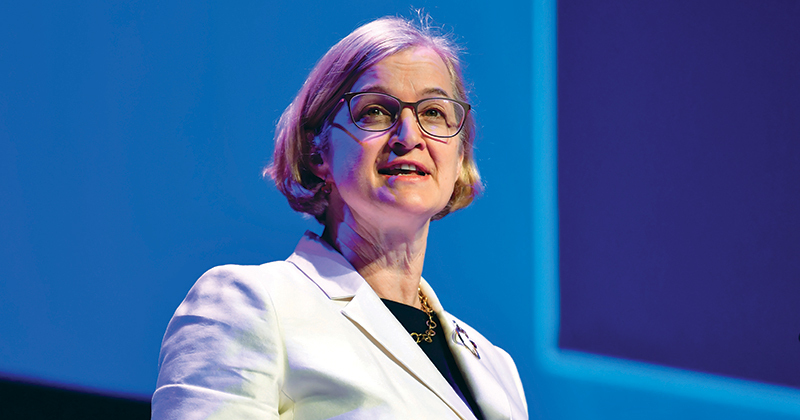 FE Week reported in January that Ofsted chief inspector Amanda Spielman had discussed the issue of resources with DfE permanent secretary Jonathan Slater last year. And Paul Joyce, the inspectorate’s deputy director for FE and skills, told MPs at last week’s select committee hearing that he’d been in discussions with the DfE for “several months” but had yet to secure a commitment for extra cash. “At the moment, the single biggest thing that worries me is the monitoring of the new provider base that we are seeing and our capacity to do so,” he told MPs. The biggest worry is the numbers of inspectors required in order to carry out inspections of apprenticeships that are of the right quality. Inspectors need to be recruited with the right backgrounds in apprenticeships [proven track records of outstanding or at least good practice as a manager, together with some form of occupational area expertise]. Currently Ofsted deem expertise as having been part of a team that has inspected apprenticeships [said in a written reply to a provider who challenged the background of their inspection team]. The Common Inspection Framework is also being rigidly applied in terms of governance expectations [as if a small provider was a school or a college] where previous inspectorates would have ignored this as not being applicable. The key to all inspection is what is the learner experiencing? And in the case of apprenticeships, are the needs of employers being met [perhaps with a view to how funding is being used directly for delivery rather than being siphoned away from the purpose intended]? Ofsted face a very difficult task and perhaps lessons need to be learned from the past when inspections of work-based learning were first set up with the Training Standards Council. Their first Chief Inspector faced a similar problem of recruiting specialist inspectors for a huge provider base which halved due to lack of quality in the three years before transforming into the Adult Learning Inspectorate. OFSTED are not equipped to carry out inspections of apprenticeship providers – no doubt this will end badly. I’m just confused about the soaring number of providers but the reported drop in new apprentices compared with same period previous year. 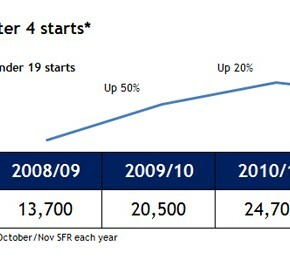 FE Week reported on 19th April that the latest government figures showed a 23% year on year drop in starts. Are there more active apprentices or less in training and if less then why the need for an extra £7m funding?